oh i think you are going to like this one. go check it at the moda bake shop! AND LEAVE ME SOME LOVE! Absolutely LOVE it!!! Awesome. Thanks for the tutorial!!! love it! and a great tutorial too! This is amazing! Can you tell me, and pardon my sewing ignorance... what kind of needle do you use to get through all those layers and cording? I want to make sure I have the right ingredients before I attempt this! Thanks so much. Very sweet! Great job on the tutorial! Great job V on the tutorial and idea! I will be making baskets as soon as I am done with baby quilts for my Lenten project. i just wanted to say that you rule on moda. 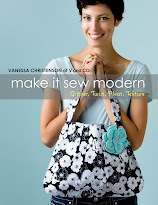 i scrolled through the rest of the page and your first moda project had 49 comments! the closest one to that was 27. you rock! That is really cute! I hope you don't mind, but I shared it in my Google Reader items. I'm in love! I may be forced to make one for my daughter's Easter basket. I LOVE this idea. I am going to buy some fabric to get this one done in time. I also love that you can make them different types of bowls but using the same techniques. I love all your tutorials! 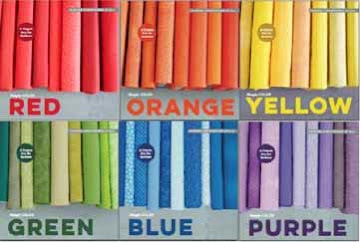 adorable... i have moda fabric in a store in our small town... going today! I am really loving this basket. so cute! oh my gosh, is that the cutest thing ever. i really love the fabric you used. So, so cute! Oh yes indeed. Love it. OMGosh...I can't belive you made that! It's beautiful. I am going over to check out the tutorial to see if maybe I can do it. I wish you lived by me...not sure how I would do out in the middle of nowhere. Vanessa, this is the cutest Easter Basket ever! You are amazing. Major Love coming from here -- it's just adorable!!! That is really, really cute!!! Cute! And yet again, you never cease to amaze me. How do you do it all and keep your house clean? I love this! Your tutorials are awesome, thanks for sharing!! Fantastic, Love it!!! Thanks for the tutorial. What is cuter than cute? Maybe adorable? Yes, it is adorable. Love it. Makes me smile. I think we all need one. You go girl- another Moda! Awesome! The basket is adorable. I am sure my partner in crime (Marlene) will be whipping these out shortly. I can't sew. Wait, I won't say can't- I don't sew yet! You are awesome. Do you sleep? Oh, I SO do! Something else I'm going to have to add to my make list! Okay! So I copy and pasted the whole tutorial into my "blogger projects to do" file!!!! Now I just need a honey bun and I'm going to get busy! LOVE it! Is there anything you can't do? So cute. OK Vanessa this is totally random, and I found out about you in a crazy way. My friend Jessica is the one who won the honey bun giveaway and she put a link to your blog on hers, so I checked it out. I'm inspired by your energy, and i couldn't stop reading your entries. After scanning a few posts from way back when, I saw you live in Loa. No way! I thought. Could that be Loa, Utah??? My parents are Don and Marsha C., my mom being my quilting/sewing inspiration. In last year's post about the fair, you put a photo of her quilt...the one you didn't know who made it (with the random stars and a mariners compass in the middle). Felicia has also quilted a top for me too. I love your photos of Loa...I used to spend summers there when my grandparents lived there (in the same house where my parents are). I miss it. Small world. I hope I can meet you next time I'm visiting. My mom has a quilt retreat every September. You should come!! Sorry for the long comment - nice to "meet" you! I had an easter basket like this when I was a little girl. Until your blog I wasn't able to ever find instructions on how to make these! your blog rocks! (and the moda bake shop!) thanks for bringing back such a great memory! I like it! So cute and colorful. see what happens when i stay in bed sick all day...i miss things like this!!! You are so TALENTED! What a fun project to do! I made a basket just like that at girls camp when I was a beehive! Awwe the memories!! oh my gosh....i use to make these with my mom when i was litte. i totally forgot about doing them. i love them! you're awesome! Um okay, V. I looked at the tutorial and that basket seems to be extraordinarily labor intensive. Like I was getting all shaky just watching you. Sewing together 4,400 little squares and then handsewing your brains out?! Don't get me wrong here, I love the basket, but you've completely overestimated my abilities. Maybe for my sake could you just do some kind of tutorial for a nice bow to put on a store-bought Easter basket? Or just show pictures of yourself eating candy or something? You blow my mind. And intimidate me more than any other person on the planet. OK, I hope you don't get vertigo from the pedestal I've put you on!! You are so inspiring!! Thanks so much for sharing!! 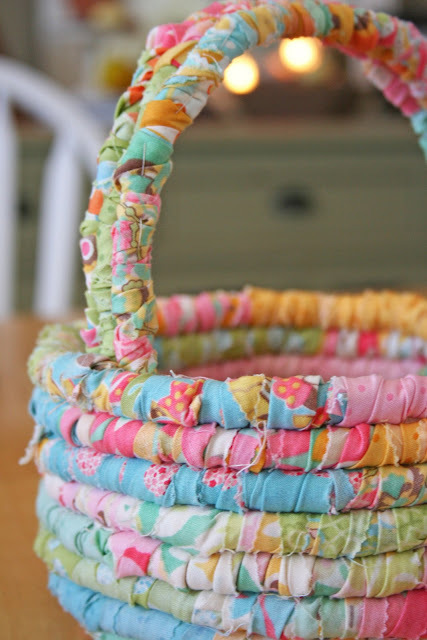 I so love the tutorial, I had so many people in my shop this weekend making these baskets! Way to go!! I love the Moda bakeshop! Thank you for this sweet tutorial! I featured the project on my blog little lovelies. You can see the post here, I think you'll like it! I am also adding you to my blogroll today. I have seen hot pads, for a table, made with this method, but not a basket. Neat.